Marketers are under tremendous pressure to optimize funnel conversion and demonstrate the value of marketing automation. But according to the latest research into lead scoring effectiveness, the majority of marketers face considerable barriers to implementing lead scoring and developing informed models. 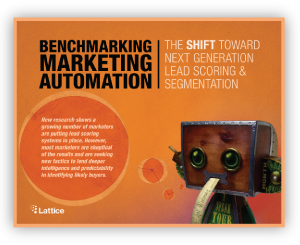 Find out what's next for lead scoring in this new report! Lattice delivers data-driven business applications that help companies of all sizes market and sell more intelligently. Inspired by today’s consumer applications, Lattice brings every relevant buying signal into the world’s most comprehensive, cloud-based applications. With Lattice, companies stop guessing and start relying on modern data science that anyone can use to find, prioritize and close their next customer. For more information, visit www.lattice-engines.com, call 877-460-0010, or email marketing@lattice-engines.com.